When I’m having a bad day, a totally can’t-handle-reality day, a trip to a metaphysical shop reminds me that magic exists. These treasure troves of curated crystals, candles, healing accessories and esoteric trinkets are run by real humans who actually live magical lives and have magical jobs and are total experts at alternative ways of thinking / being. Wonderworks is a “wellness lifestyle” store, which means they sell mostly home decor and accessories. They’ve got knick-knacks like terrariums for your bedroom, goddess statues for your shelves, teas for your kitchen, and candles, crystals and sprays for everywhere else. These guys have been open since the 90s, back before a spiritual / metaphysical lifestyle was en vogue, so they know their stuff. If you’ve ever wanted to learn meditation from an expert, you can do it here at one of their weekly mindfulness meditation daily practice group sessions. 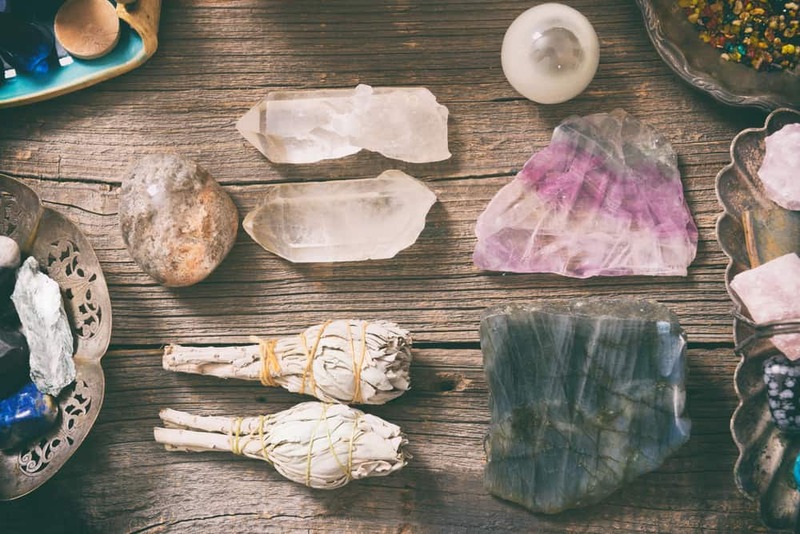 For crystal collectors and card slingers and anyone interested in learning more about spiritual healing, The Rock Store is a v. accessible resource. Walk in here and you’ll instantly feel the good vibes (crystals of all kinds line the walls). If it happens to be community you’re seeking, this store also runs public events programming like reiki and tarot workshops and seasonal rituals, where you could meet your new magical BFF as you hone some new skills. This welcoming shop sells hand-picked, great condition used books, new and older tarot and oracle decks, oils, herbs and crystals. The owner, Andrew McGregor, does tarot readings and also makes magickal portraits. Listen to his podcast, The Hermit’s Lamp Podcast – A place for witches, hermits, mystics, healers, and seekers, to hear him chat with other spiritually minded folk on living a spiritual life in the modern world. Tell the staff here what you’re looking for (migraine aid, a daily protective shield, a rock to keep by your laptop…) and they’ll direct you to a crystal that can help. They also stock a small selection of other trinkets for spiritual work, so you can freshen up your altar with a new singing bowls, candle holders or smudge sticks. You can get the full “alternative thinking lifestyle” experience here at this shop / cafe in the annex. Enter through the cafe, which serves organic soups and salads, and make your way into shop, where you’ll find yourself among shelves of new age books, natural food products, sacred geometric art, clothing and tapestries. Be prepared for some strong-smelling aromas and deep house music. This place is intense.